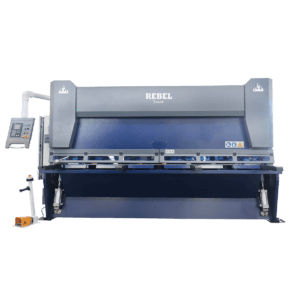 The PB Series metal shearing machines are manufactured using components that are recognized for their superior quality and easily accessible on the market. Our industrial hydraulic shears with pneumatic plate support allow cutting metal from 1/4 “to 1” for a length of 8 to 20 feet. After welding, the frame of PB series Sheet Metal Shears is processed by CNC heptahedron at one time to ensure the rigidity and accuracy of the shears.